"Star Wars: Jedi Challenges" now allows lightsaber battles against each other in local multiplayer mode. This the newest feature expansion for the smartphone-powered augmented reality (AR) experience from Lenovo and Disney. The feature update, titled Lightsaber Versus Mode, is the second free update since the product launched in November 2017. Lightsaber Versus Mode is available now in the Star Wars: Jedi Challenges app, which is free to download on the App Store and Google Play Store. As part of the Lightsaber Versus Mode update, players can use visual cues to suggest when and where to block a blow, dodge or perform a sword thrust. During the duel, the level of difficulty increases until one of the players wins. Each player must download the latest version of the "Star Wars: Jedi Challenges" application on a compatible smartphone connected to the same Wi-Fi network. ● Lightsaber Battles: The player can polish the lightsaber skills by fencing duels with the biggest villains on the dark side of the force, such as Kylo Ren or Darth Vader. In the new mode, Lightsaber Versus Mode can also fight a second real person in the same room. ● Strategic Combat: The player commands large armed forces in land battles. ● Holochess: The player can defeat opponents thanks to the unique concentration and strategy in the favorite board game Star Wars series, which appeared for the first time in the movie Star Wars: Episode IV - A New Hope. 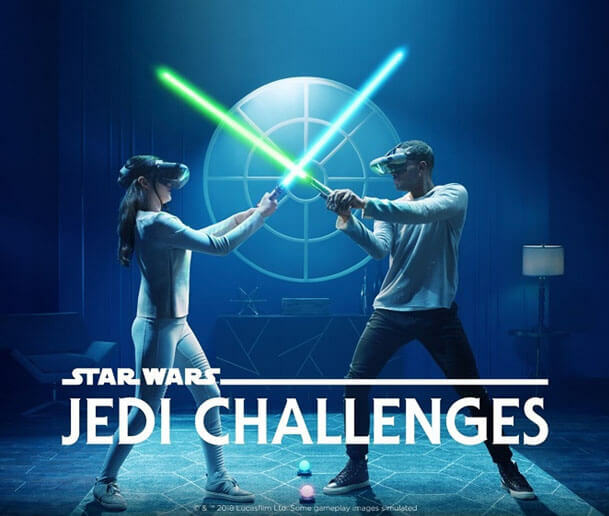 Star Wars: Jedi Challenges can be purchased at www.jedichallenges.com and selected stores in the country, such as Villman, Silicon Valley, Gigahertz, DS Gadgets and select PC Express branches for Php14,995. The package includes Lenovo Mirage AR headset, lightsaber controller, tracking beacon, phone tray, lightning to Micro-USB cable, USB-C to Micro-USB cable, 2 AA batteries, wall charger, and quick start guide.